At the risk of stating the obvious, we all enjoyed holidays growing up. What’s not to love, right? But let’s be real. Holidays are exponentially more fun when you have kids yourself, and few are more fun than Easter. From the Easter Bunny to egg hunts, it’s the kind of day where little ones lose themselves in wonder and imagination — starting with a cute Easter breakfast. Right, Mom? If you’re anything like us, making special holiday breakfasts has become one of the most joy-filled parts of being a parent. Sure, you might gripe about getting up early to flip pancakes every other day of the year. But there’s simply something so fulfilling about adding this extra special touch to an already special day for your kids. Besides, the cheery spirit of Easter basically begs for the day to start out with something sweet. Something colorful. Something exuberant. There’s no shortage of inspiration, that’s for sure. 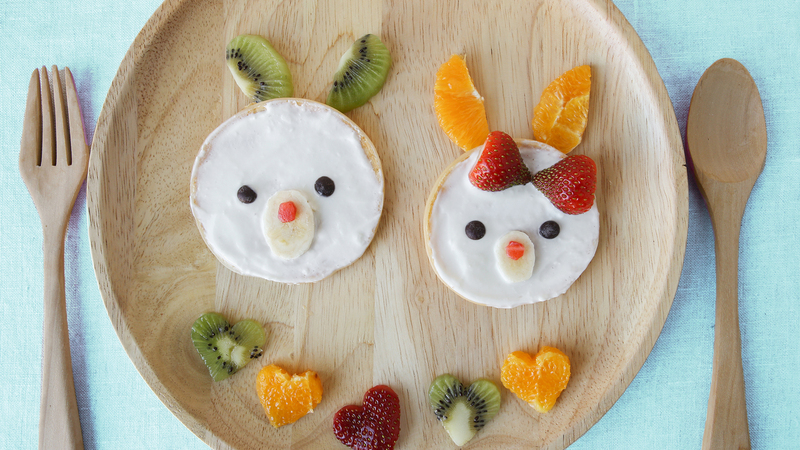 Just take a look at the following Easter-themed breakfasts! Your little ones (and, c’mon, you too) will be more than hoppy, er, happy to scarf ‘em down. What Mama doesn’t love whipping up a breakfast that’s quick, easy and healthy? The genius of Fork and Bean’s Easter bunny waffles lies in starting with (gluten-free!) frozen waffles. No muss, no fuss. Add strategically placed fruit, and you’ve got a dish your kids will “ooh” and “ah” over. If you’re already anticipating all of the sugar your kids are going to consume once they did into their Easter baskets, this breakfast is for you. Eats Amazing’s healthy Easter egg breakfast pops still boasts the fun factor (all kids go cuckoo for “cake” pops) but is refreshingly nutritious, too. Bonus? They’re easy to customize, so you can let your kiddos pick out the fruit filling they prefer. We don’t know about you, but “egg in a nest” was always one of our favorite breakfast foods growing up. It might just be eggs and toast, but there’s something about the egg being cooked from a hole inside the bread that just sort of makes it magical. Barefoot Kitchen Witch gives it a truly fantastical Easter spin by using a bunny cookie cutter to carve a “nest” for your eggies. First of all, can we take a moment to appreciate that — despite adorable and oh-so-impressive — these precious little treats from It’s Always Autumn require only five ingredients? Although, if you really want to start Easter off on a super-sweet note, you could add a sixth ingredient: a drizzle of honey! Give your little chickies something to crow about come Easter morn when you serve them, well, little chickies. You’ll want to whip up a batch of The Healthy Tart’s strawberry puree because it’s healthy, vegan, gluten-free and full of good stuff like fiber. And your kids will get a real kick out of having such gosh-darn adorable baby bird faces staring back at them.